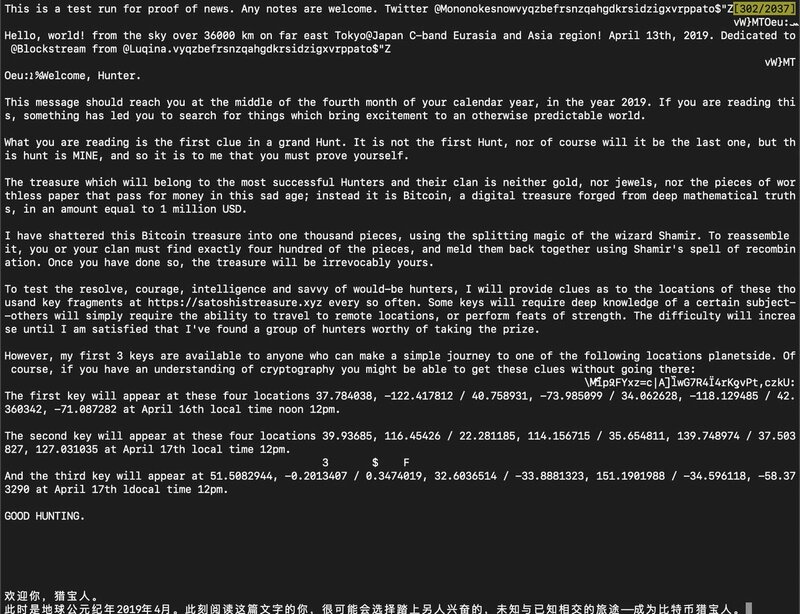 A $1 million BTC treasure hunt has been launched by a mystery crypto enthusiast. A message was posted anonymously on the Blockstream Satellite real-time data service. According to the long, rambling post, the Bitcoin treasure hunt is designed to bring "excitement to an otherwise predictable world". A significant amount of Bitcoin will be the prize to whoever discovers the treasure - around 159 BTC according to current prices. It seems as though the treasure hunt is due to last for a while, with a number of clues that are designed "to test resolve, courage and intelligence...What you are reading is the first clue in a grand Hunt. It is not the first Hunt, nor of course will it be the last one, but the hunt is MINE, and so it is to me that you must prove yourself." The first three "keys" in the hunt have been released already, on the website satoshistreasure.xyz. They are apparently known as The Jade Key, The Bismuth Key, and Mamoru's Key.